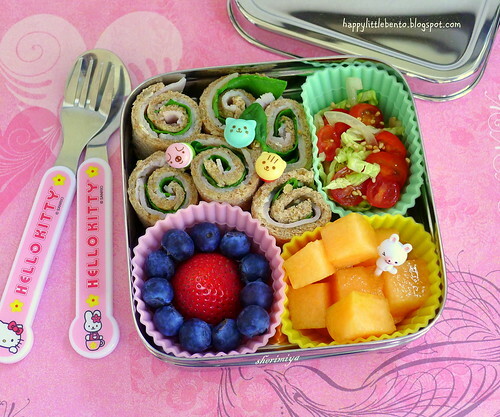 Sandwich Rollups EcoLunchBox Bento, a photo by sherimiya ♥ on Flickr. 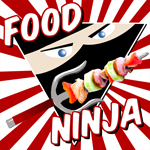 Even though my kids usually eat the "dinner leftovers" type of bento quite often, they are just like all other kids and love the bitesize sandwich rollups too (maybe even more). My kindergartner always prefers to eat with her fingers so a bento like this is a hit with her. Since there isn't anything saucy to drip out, a bento like this is ideal for the EcoLunchBox Solo Cube. I secure it with an elastic band and it's good to go. Besides the whole wheat spinach brie and turkey rollups (I flattened the bread with a rolling pin first), I packed a cabbage onion tomato slaw, a cup of juicy cantaloupe, a strawberry, and some blueberries. This will just about satisfy her appetite, I think! The sandwich rolled up looks yummy and love the idea of blueberry/strawberry flower! I love it!! The berries look really cute as a flower :) Will you make me one too?